I’m no artist, that’s for sure! But, I think I’ve acquired one skill that seems to be disappearing. It’s the lost art of the hand written thank you note,. First of all, thank you notes are becoming more and more scarce in any form. Receiving a text message, e-mail or facebook message saying “thanks” is better than nothing. However, getting a hand written note in the mail is even more unusual these days. 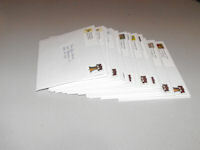 Thank you notes written by hand, with postage attached and placed in a mail box requires time, thought and effort. You must secure the proper stationery. You must locate the person’s home address. You must then use your own hand to write the note. Finally, you must spend your money buying postage and mailing the note. I was recently given a wonderful baby shower by the people in my church. I received many special gifts for my little-one-on-the-way. I wrote each person a note of thanks and mailed them. It took several hours. It took work. But I feel that was the least I could do for the kindnesses that were bestowed upon me and my baby. I try to write thank you’s for all birthday gifts and Christmas gifts, as well. I’m sure I’ve missed someone, sometime, somewhere (blushing) – but I hope not! I suppose as the world of technology expands, personal letters, notes and cards will diminish and finally disappear. I hope that won’t happen completely until I’m dead and gone. I enjoy getting real mail very much (and e-mail, too), and I try to send it out to others as well. Writing notes and cards to others is a small thing that I can do to cheer someone or share my heart. I have four children, and one on the way. I homeschool them and have many household chores to do, so making personal visits is hard for me to do in this season of life. Sending a note is my way of “calling on” someone. I agree completely! It means so much to me to receive a handwritten note, especially one that reflects the genuine appreciation of the recipient of my gift.